Take a break from the cold weather and warm up with cake! 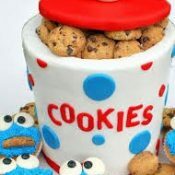 Learn how to make and decorate a cookie jar cake along with a cute cookie monster cupcake. Students will use buttercream icing, fondant and learn how to use a variety of piping tips and some fondant tools. All decorating supplies, tools and box to take cake home is included. We will show you just how easy it is to create professional looking cookies. Learn how to outline, flood and create easy designs using royal icing. Class will include learning the proper consistency and techniques using royal icing to achieve a smooth look on your cookies. Also, a demo on rolling and baking tips for cut-out cookies. 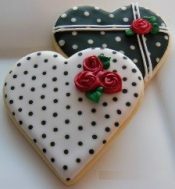 Also, plenty of time for you to practice on approximately 10 – 12 Winter and Valentine themed various shapes and sizes sugar cookies. Recipes included. Minimum age recommended: 14 yrs. 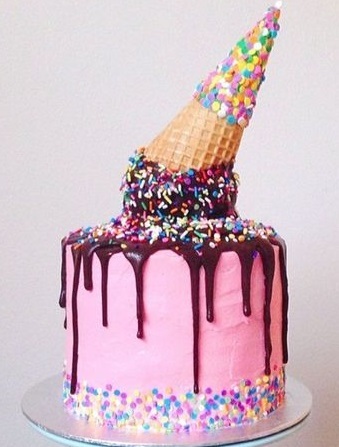 The heat won’t melt this ice cream cone!! Learn how to create scoops of ice cream out of cupcakes. We will show you how to decorate the cupcakes using different icings, sprinkles and decorating techniques. Color takes the cake in 2017! 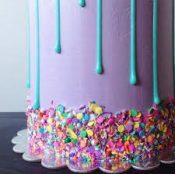 In this class we will demo how to color cake batters and bake to make different effects for the insides of cakes and cupcakes including rainbow graduated colors, tie-dye, polka dots, etc. Then we will demonstrate how to decorate outside of the cake using the drip technique, tie-dye and sprinkles. These fun techniques make the inside and outside of the cake a colorful surprise when served and cut. Samples and recipes included. Minimum age recommended: 12 yrs. 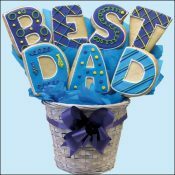 We will show you how to create an awesome Father’s Day cookie bouquet using an assortment of decorating tools and edible decorations to make 7 decorated cookies. Then you will arrange them in a container and add your own special touches. Recommended for ages 5 and up. 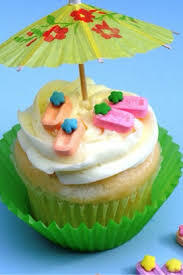 Learn how to make fun summer theme cupcakes by using multiple decorating techniques and fun toppings. Each student will leave with a six decorated cupcakes. Recommended for ages 5 and up. Learn how to decorate fun summer themed cookies. Students will use royal icing and other types of icing to flood and pipe fun details. Each student will leave with 6 of their very own decorated cookies. Recommended for ages 5 and up. Students will make their own cake balls. A combination of cake and icing rolled in a ball and covered with chocolate. 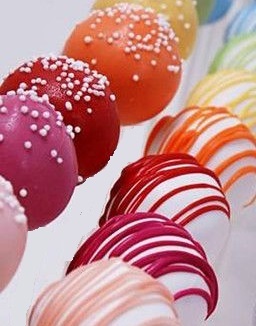 Cake balls will be summer themed along with a variations of flavors. Recommended for ages 5 and up. Candy, candy and more candy! In this class we will be making bark type candies, dipped cookies and pretzels, white chocolate popcorn and more. 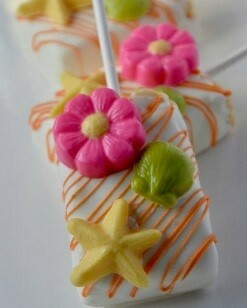 Everyone will bring home a box of summer themed sweet treats. Recommended for ages 5 and up. We will show you just how easy it is to fill, stack and ice your 5” three layer cake. 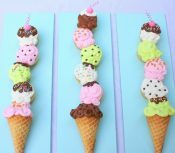 You will learn how to make a melting ice cream cone drip cake using a variety of decorating supplies and tools. Recommended for ages 5 and up. Join us in a magical Unicorn class! In this class, you will learn and make your very own Unicorn Treats! From unicorn cupcakes, unicorn horns, to unicorn cookies and more! Recommended for ages 5 and up. 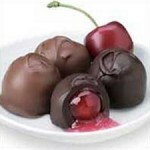 Make a variety of valentine candy perfect for your sweetie. The candy will use a combination of cookies, molded chocolate, marshmallows and other sweets to create a beautiful box of candy for Valentine’s Day. It’s almost that time again. 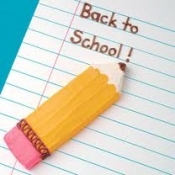 Why not head back to school with some fun treats to share with your teachers and friends. We will show you how to make edible crayons, eraser, pencil and more using a variety of techniques and tools including pretzels, chocolate, cookies just to name a few. Recommended for ages 5 and up.